“Save the Deli” by David Sax tracks the history of Ashkenazi Jews – the plight they faced as they were chased around the globe, scapegoated, killed and survived for hundreds of years. And it is the story of the food they took with them and the delis they established to become the social centers and meeting halls for the community. The heydays of the true Jewish deli, or kosher deli, are behind us now. But Sax manages to find classics in every region of the U.S., parts of Canada, and several cities in Europe. He walks a thin line between despair over the loss of thousands of family owned delis, the rise of corporate delis, compromises that diminish the truth of the food and lead to the loss of traditional dishes in the name of survival, and the joy of finding fine new delis in some unexpected places. Sax makes some startling discoveries of quality delis in such places as Boulder Colorado, Ann Arbor Michigan, Paris France and Houston Texas. He pronounces Los Angeles the best deli city in the world. He hails Brent’s Deli in the San Fernando Valley for an “unsurpassed” quality of food and proclaims the pastrami at Langer’s in downtown Los Angeles as the best anywhere. Both of these delis are recommended at the restaurant recommendation web site atLarrys.com. You can learn more about them at http://www.atLarrys.com. 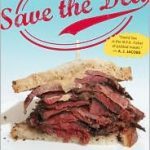 The stars of Sax’ book are the deli owners who are fighting to preserve the traditions of deli food – those who take a brisket and turn it into unique versions of corned beef by adding their own special seasonings, those who create their own renditions of matzo balls, those who shun mass produced kishka in favor of their own handmade versions. He talks with owners of troubled delis struggling to hang on, to deli owners who have had to give up, and to those who are opening new delis in the face of long odds against survival. Through it all is woven the story of the Jewish Diaspora and how true deli food is central to the culture of those who have been forced from their homes and homelands time and again throughout history. 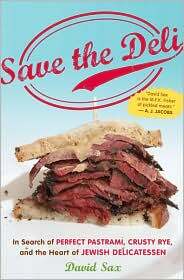 The pages of “Save the Deli” are laden with knishes, kreplach, schmaltz, rugulach, and other artery-hardening wonders that have sustained a people through generations and now are mainstream fare of varying quality across the U.S. and abroad. If Sax had written a travelogue of delicatessen it would become boring very quickly. If it was an attempt to create a guide book for great pastrami, corned beef, tongue, or brisket, it would gather dust on a shelf. Fortunately, “Save the Deli” is neither of those. Instead it offers tips on where to stop for quality and original deli food and places we might want to avoid, all woven into the personal stories of those he encountered along the way.